Astronomers have discovered a new intriguing exoplanet about the mass of the earth, orbiting a star in the Alpha Centauri star system -- the nearest to our planet. It is also the lightest exoplanet ever found around a star like the sun. The planet was detected using the HARPS instrument on the 3.6-metre telescope at ESO's La Silla Observatory in Chile. Alpha Centauri is one of the brightest stars in the southern skies and is the nearest stellar system to our solar system -- only 4.3 light-years away. 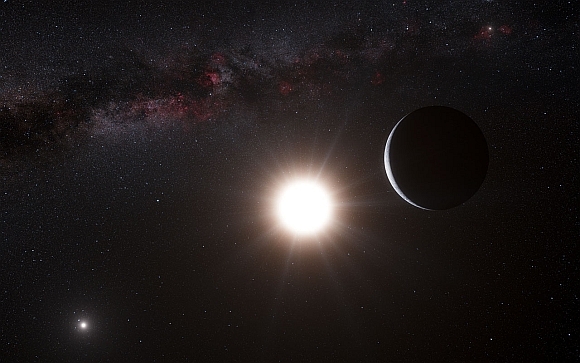 It is actually a triple star -- a system consisting of two stars similar to the Sun orbiting close to each other, designated Alpha Centauri A and B, and a more distant and faint red component known as Proxima Centauri. "Our observations extended over more than four years using the HARPS instrument and have revealed a tiny, but real, signal from a planet orbiting Alpha Centauri B every 3.2 days," says Xavier Dumusque, lead author of the paper. "It's an extraordinary discovery and it has pushed our technique to the limit!" Dumusque said. The European team detected the planet by picking up the tiny wobbles in the motion of the star Alpha Centauri B created by the gravitational pull of the orbiting planet. Alpha Centauri B is very similar to the sun but slightly smaller and less bright. The newly discovered planet, with a mass of a little more than that of the earth, is orbiting about six million kilometres away from the star. The first exoplanet around a sun-like star was found by the same team back in 1995 and since then there have been more than 800 confirmed discoveries, but most are much bigger than the earth, and many are as big as Jupiter. "This is the first planet with a mass similar to earth ever found around a star like the Sun. Its orbit is very close to its star and it must be much too hot for life as we know it," said Stephane Udry, a co-author of the paper. "But it may well be just one planet in a system of several. Our other HARPS results, and new findings from Kepler, both show clearly that the majority of low-mass planets are found in such systems," Udry said in a statement. "This result represents a major step towards the detection of a twin earth in the immediate vicinity of the Sun. We live in exciting times!" concludes Dumusque. Why was Kevin Pietersen forced to apologise?